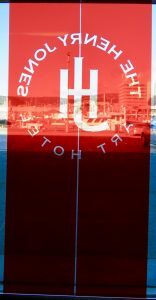 In the afternoon, we caught a flight from Melbourne to Hobart, Tasmania. Curious about the locale and its people, I’ve always wanted to visit the island, and I was excited that it would finally happen. While I call myself an ultramodern minimalist, I love all periods of architecture—ancient to modern. But what fascinates me the most about old buildings is their past. How did they come to be what they are today? 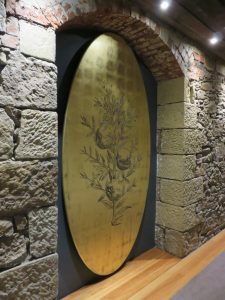 So when I saw The Henry Jones Art Hotel in Hobart, I couldn’t wait to delve into the history of the old brick warehouses that front the wharf. 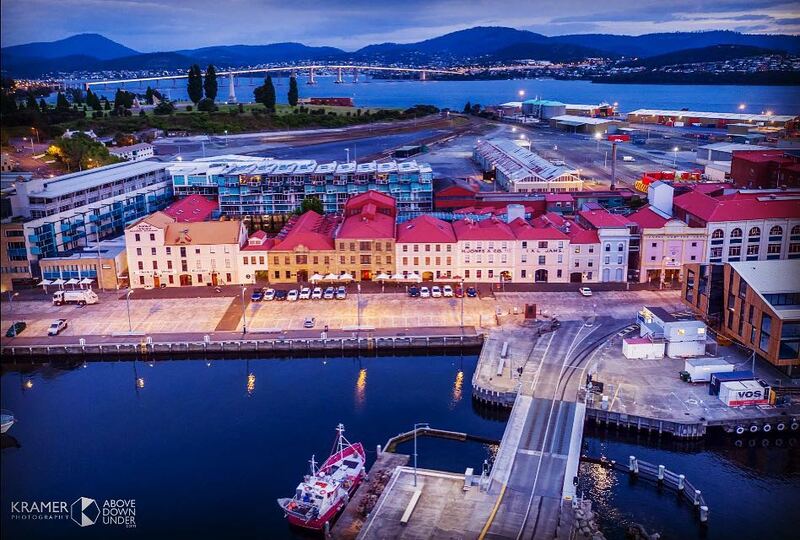 Since I was in no position to capture an aerial shot of the Hunter Street causeway, I asked photographer Dee Kramer for permission to use her photo of Hobart, which gives the reader an excellent view of the entire waterfront as it appears today. To the left of the photo is the Drunken Admiral, a restaurant, and The Henry Jones Art Hotel is to the middle right. You can just make out the lettering on the two buildings. The hotel is to the left of the pale blue building. Both establishments will be mentioned in the next few blog posts. After my initial research, I became addicted to delving into the compelling convict history of the island. Why, you might ask? Because from the checkered pasts of their parents, the children of convicts went on to achieve such amazing accomplishments. Some parents’ crimes were petty, while others were quite serious, but so many of the descendants of convicts had much to be proud of. One such person was Sir Henry Jones, knighted in 1919 by King George V. Jones’s citation read, “An architect of his own fortunes and his ability and enterprise had a giant influence upon the progress of Hobart and the state of Tasmania.” The quote is from a magazine article in Tasmania 40ºSouth titled “Henry Jones rediscovered” by writer Craig Sampson, the great-grandson of Sir Henry Jones. Photo: The Henry Jones Art Hotel. For Tasmanians, even as late as the 1970s, having European ancestors who were “free settlers” was something to feel smug about, as opposed to being stained by those who were convicts. During the late eighteenth and early nineteenth centuries, the British sent more than 165,000 convicts to Tasmania. The first jail was built at Risdon Cove, but in 1804 the prisoners were moved to Sullivan’s Cove—soon to be called Hobart. The most hardened criminals were housed at Port Arthur. In 1804, Lieutenant Governor David Collins stepped onto the shores of Hunter Island in a remote corner of Van Diemen’s Land, the original name for Tasmania. The Dutch explorer Abel Tasman was the first European to explore the island, and he named it after Anthony van Diemen, the governor-general of the Dutch East Indies. The name was changed to Tasmania in 1856. Collins’s arrival marked a new era of change with the settlement of Hobart. Soon Hunter Street was constructed on the old Hobart Town causeway, which once joined Hunter Island to the shores of Sullivan’s Cove. In 1820, a stone causeway wide enough to accommodate two carts passing each other was built over the original roadway, and the first warehouses were constructed to cater to the growing number of ships docking at the harbor. Photo: Front door of the hotel. Inside looking out. Factories, storehouses, and dwellings emerged, like nearby Wapping, the unofficial name for a closely settled working-class neighborhood alongside Hobart’s first wharf. Like its London namesake by the Thames, it was a low-lying, flood-prone district dominated by the nearby docks. Two streams emptied into the flat, marshy area including the town’s water supply and drainage system, the Hobart Town Rivulet. Over the next fifteen years, the settlement grew rapidly, fed by the thriving whaling and sealing industries, and a steady supply of convict labor. In the 1830s, a severe depression hit Hobart. The whaling industry collapsed from overexploitation, a new wharf had been constructed across the bay (at what is now Salamanca Place), and the Old Wharf and nearby Wapping were gripped by poverty. The rivulet that supplied Wapping with fresh water had become polluted from factories and slaughterhouses. Disease was rampant, slums proliferated, and the buildings of Old Wharf fell into disrepair. With its brothels, taverns, and nefarious activities, the Old Wharf developed a reputation for wickedness.Photo: New artwork on the original warehouse walls. In 1869, businessman George Peacock moved his successful jam-making business to his newly acquired warehouses on the Old Wharf—the best location in Hobart for exporting produce. Peacock Jams were in high demand, and the shrewd businessman had a vision and determination to expand his flourishing business. Peacock arrived at Hobart Town in 1850 and opened a grocery and fruit shop. By 1867, he had become one of the first manufacturers of canned jam in the colonies. 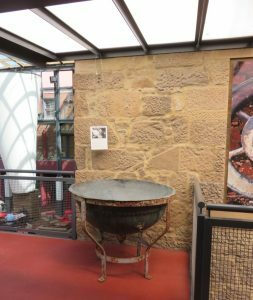 In 1869, he moved his factory to a large stone warehouse on the Old Wharf, with copper pans and two boilers to supply the necessary steam for canning. A hard worker and disciplinarian, according to his factory hands, Peacock was also interested in their welfare. He conducted hymns and prayers at the start of each day’s work, strongly disapproved of blasphemy, and dismissed any man who drank. Henry Jones was born in 1862 in Hobart Town, the second son of John and Emma Jones and one of eight children—three boys and five girls. Emma arrived in Tasmania in 1848 at the age of eighteen, sentenced to seven years for the theft of￡300 from her former employer, and John arrived in 1850, sentenced to ten years for stealing a gold watch. Young Henry was educated at Mr. Canaway’s school, where he excelled in commercial subjects. At the age of twelve, he went to work at Peacock’s jam factory–his first and only employer. Working ten hours a day, six days a week, he pasted labels on jam tins and within a few years became an expert jam boiler. Henry rose through the ranks of the expanding Peacock empire, and when Peacock retired, took control of the jam company in partnership with A. W. Palfreyman and Peacock’s son Ernest. Photo: Jam boiler at The Henry Jones Art Hotel. With Jones at the helm, new premises were built, the range of canned products was diversified, and the partners entered the hop production business and the overseas export trade. During the partnership period, Jones adopted the brand name IXL (a play on “I excel”) and was himself popularly dubbed “Jam Tin Jones.” He eventually took over the business that bore his name—H. Jones and Co. Pty. Ltd. In 1902, the partnership was dissolved and a limited liability company was formed—Henry Jones Co-Operative Ltd. Jones was a shrewd investor, but his greatest profits came not from jam but from the Thailand tin-dredging industry. , followed by the Tongkah Harbour Tin Dredging Co. and Tongkah Compound. The word “Tongkah” entered the Hobart vocabulary as an adjective denoting good financial luck. Sir Henry Jones died in 1886 and was survived by his wife Lady Alice and their twelve children—three sons and nine daughters. Lady Alice received the title “Lady” upon Henry’s knighthood in 1919. She went on to be known as “The Lady of Tasmania” and a major patron of the arts in Hobart. 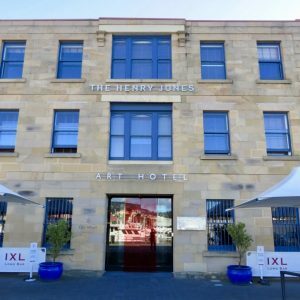 In the late 1970s, Henry Jones IXL Jams, one of Australia’s most successful companies, shut down, and the properties languished until 2004 when architects Morris-Nunn & Associates (now Circa) won the right to revive the historic site, transforming the former jam factory into Australia’s first dedicated art hotel. 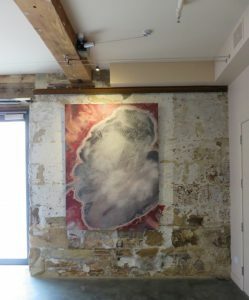 At the Henry Jones, sleek modern decor and contemporary art complement the untouched nineteenth-century sandstone walls, and the original warehouse windows offer an unobstructed view of Hobart’s harbor, the city, and the mountains beyond. In 2005, what remained of the IXL parent company, after mergers and sales, is now owned by Coca-Cola Amatil. And in 2008, Federal Group purchased the Henry Jones Hotel. Next week: Tasmania 2014: Hobart—Part 2. This entry was posted in Settings, Tasmania, Travel, Writing and tagged Anthony van Diemen, art, Aussie, brothels, canned jam, causeway, Circa Architects, Coca Cola Amatil, convicts, Dee Kramer Photography, docks, Drunken Admiral, Dutch East Indies, factories, Federal Group, George Peacock, H. Jones and Co. Pty. Ltd., harbor, Hobart, Hobart Town, Hobart Town Rivulet, Hunter Island, Hunter Street, Kiwi, knighthood, Lady Alice Jones, Lieutenant Governor David Collins, London, Melbourne, New Zealand, Old Wharf, Peacock Jams, Salamanca Place, Sir Henry Jones, slums, storehouses, Sullivan's Cove, Tasmania, Tasmania 40ºSouth, Thailand, The Henry Jones Art Hotel, The IXL Prospecting Co, Tongkah, Tongkah Harbour Tin Dredging Co., Van Diemen's Land, Wapping, warehouses on November 30, 2017 by admin.